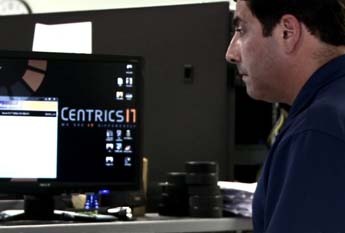 CentricsIT is a one-stop shop for all enterprise IT needs. While CentricsIT carries a full inventory of brand new IT equipment from all the major manufacturers, we also specialize in selling used and refurbished machines. We complete a 101-pt inspection on every used machine in our warehouse. Your used hardware will be in top condition when you buy it. Guaranteed. Equipment is carefully inspected for damages upon arriving at our warehouse. Each cover and component, including the chassis, is examined for dings, dents, scratches, and bends. Special attention is paid to delicate plastics that can be easily damaged from the weight of the chassis shifting during transport. Part numbers are verified and recorded. Model number is verified by machine configuration. Serial number(s) are verified as valid and maintainable with manufacturer. Part numbers are verified, and anything needed to bring the equipment up to present-day EC specifications is noted. External ports are inspected to assure proper retaining screws and latches are in place. Unused disk bays are noted to have appropriate fillers to maintain proper airflow. Completeness of equipment is noted, stating what is missing in order to acquire missing components prior to resale. Any unusual smells are noted (such as component burn smell). Internal components inspected for oxidization and discolorations. Reseating of components is performed to prevent invalid errors from occurring during the power-on self test. Proper placement of adapters is verified. Proper placement of memory is verified. Memory slots are inspected and verified to have all working insertion and extraction tolls in place. Memory slots are inspected and debris is removed or blown out. Adapter slots are inspected and debris is removed or blown out. Disk slots are emptied and blown out to remove debris. Empty adapter card and memory slots are inspected to contain filler panels to ensure proper air flow. CPUs are inspected to ensure they have proper type and amount of thermal protection paste. CPU fans are inspected for obstructions and cleanliness. CPU heatsink is inspected for proper type, alignment, and securing hardware. The mechanical aspects and covers and cover latches are tried and inspected for proper alignment and function. Cover sensors are inspected and tested for function. Cover grounding strips are inspected for cosmetic blemishes and function. Audible alarms and speakers are inspected and tested for function. Disk latches and clips are inspected for proper function. Disk bay grounding strips are inspected for proper function. DVD eject buttons, doors, and trays are inspected and tested for proper function. Proper disk removal and insertion are checked. The mechanical aspects of key locks are tried and inspected for proper function. Power button is inspected to assure proper function. Power-on self test is performed. Indicators and information are observed for proper sequencing and desired result. Power-on indicators are observed for proper sequencing and desired result. Self-test indicators are observed for proper sequencing and desired result. POST output is observed to confirm proper configuration. POST output is observed to discover errors. Disk drives and devices are observed for desired result. Testing is elevated (after successful completion of power-on self test) to the next level by implementing a full and complete diagnostic test. Power on/off switch/button is inspected during power-on self test. Power supplies are inspected during power-on self test. Power supply fans are inspected for function and obstructions. Fan assemblies are inspected during power-on self test. Indicator lights are inspected during power-on self test. Noise levels on fans are inspected during power-on self test. Noise levels on disks are inspected during power-on self test. Interface cards are inspected during power-on self test. Disks and disk indicator lights are inspected during power-on self test. CPUs are inspected during power-on self test. Memory is inspected during power-on self test. Motherboards are inspected during power-on self test. Non-working components are replaced or repaired. Firmware versions on motherboards are updated to compatible and current firmware and upgrade levels. Firmware versions on memory cards are updated to compatible and current firmware and upgrade levels. Firmware versions on disks are updated to compatible and current firmware and upgrade levels. Firmware versions on CPUs are updated to compatible and current firmware and upgrade levels. Firmware versions on interface cards are updated to compatible and current firmware and upgrade levels. Internal batteries are tested for proper voltage levels. Equipment is inventoried and stored, conforming to static shielding for electronic equipment. Equipment is stored, utilizing an identification and location bar-coded inventory system. Custom configurations are completed according to the proper specifications. Special attention is placed on compatibility of installed components, firmware levels, and software. Proper cabling for internally installed components is verified. Proper cables for externally attached devices are verified. Cables are inspected for attaching hardware. Proper termination requirements are checked on SCSI bus. A full diagnostic is performed on the final configuration. Proper power cord requirements are verified. Equipment racks are inspected for proper floor stabilizers (feet). Equipment racks are inspected for proper grounding equipment. Equipment rack casters are inspected for proper completeness and function. A second technician verifies all aspects of configuration and quality. Order is compared to final configuration. Bar codes are scanned for order and inventory accuracy. Equipment is re-checked for cosmetic issues. Any cosmetic issues are corrected. External surfaces are cleaned of glue, ink, dirt, etc. Packaging personnel verify the equipment against the order form. Packaging personnel verify the presence of rack mount kits and hardware. Desk side and desk top equipment is verified to have proper stand. Power cord presence and requirement is again verified. All items are packaged in static shielded environments. Custom reinforcement packaging products are placed around delicate areas of equipment to prevent damage. Accessories are separated within the packaging to prevent damage to/from the main unit. Special packaging is used to prevent movement and damage of the equipment within the box during transport. A minimum three-inch space for packaging material is required around the unit as it is places in the box. Reinforced fiber tape is used the secure the box closed. Heavily weighted equipment is boxed and strapped to a pallet. Corner boards are used to help protect equipment against shipping damage. Tip indicators are used to help identify mishandling during shipment. Shock indicators are used to help identify mishandles during shipment. Shrink wrap is used to help prevent water damage during shipment. Packing slip is placed in envelope and attached to package. Air bill/Freight bill is attached to package(s). Tracking number is automatically sent to customer at e-mail address provided. Package is tracked electronically by tracking number, and delivery is verified and confirmed. Customer is called to verify receipt and complete satisfaction of ordered equipment. One call takes care of your entire data center. If you have further questions about our 101-pt Inspection, contact us today.